Julie juggled worries about how muscular dystrophy effected not only Natalie but her little sister Avery, as well. We had the chance to chat with Natalie, who is now 10, and find out what she likes to do in her spare time, what she loves most about MDA Summer Camp and how she #LivesUnlimited. Keep reading to learn more about this spirited Shamrockstar! What do you like to do in your free time? I like to play soccer and play with my sister. What are three things most people don’t know about you? I play soccer, I used to be able to walk, and I grow a garden. What is your favorite thing about MDA? Camp! What is your favorite memory from MDA Summer Camp this year? Meeting my counselor. What do you want to be when you grow up and why? I want to be an architect and build accessible homes and buildings. How do you defy your limits and live unlimited? I do things that people think I’m not going to be able to do, I just do them differently. 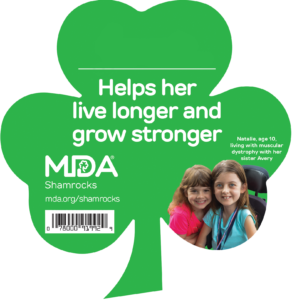 What is your favorite part of MDA Shamrocks season? Going to all of the participating stores and taking pictures. Why do you think people should support MDA? To find a cure for our disease and get to be able to do stuff at camp that we can’t do anywhere else. Do you have a favorite MDA partner you enjoy visiting, or have a special relationship with? Lowe’s in Woodlands because they were so happy when I came to visit their store.